How many of you love listening to music? For me, music has always been a huge part of my life. I can’t imagine even going for a small drive or walk alone without listening to something. While I love music, my biggest problem has always been finding headphones that I love. Even though I do have an awesome set of wireless headphones that I wear for exercising and walking, I don’t feel comfortable traveling with them, with their high price tag. 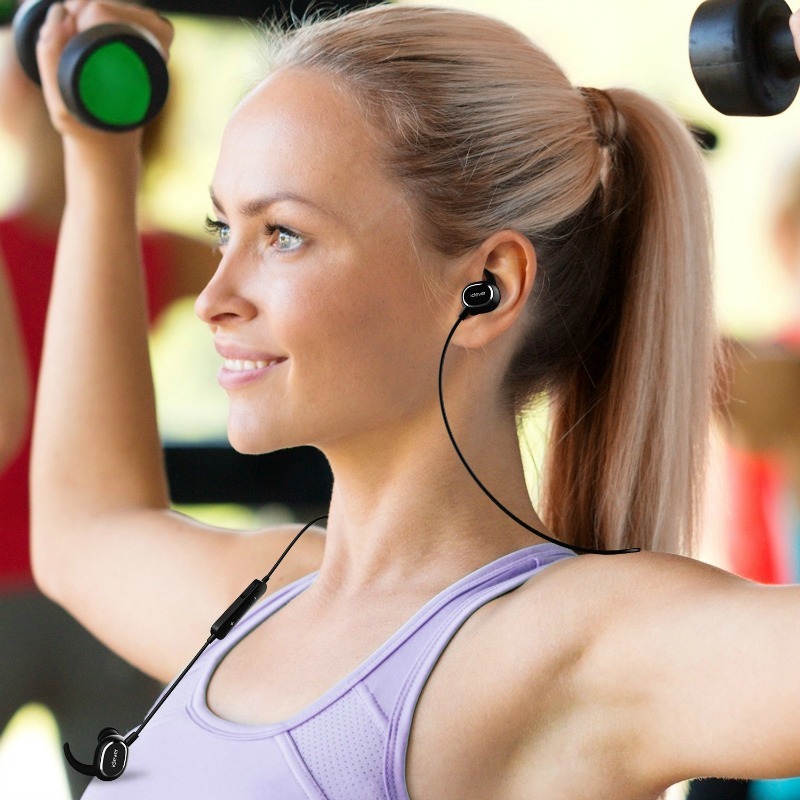 For that reason, I have been searching for a pair of inexpensive headphones that I could bring with me on the go for listening to music while exercising in a hotel or listening to music on a plane. During my search, I was contacted by iClever, asking if I would be willing to review a complimentary pair of iClever Noise Cancelling Sports Earphones. Having had good experiences with the brand in the past, I couldn’t wait for them to arrive and get started. 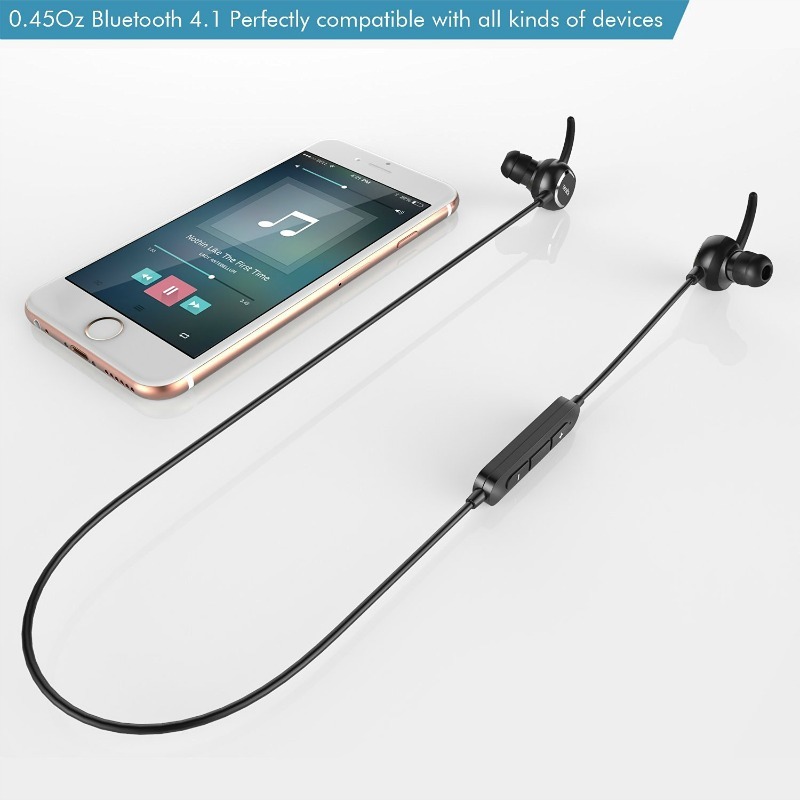 iClever Noise Cancelling Sports Earphones: What Are They? Looking for an inexpensive, high quality headphone set to bring with you on the go? 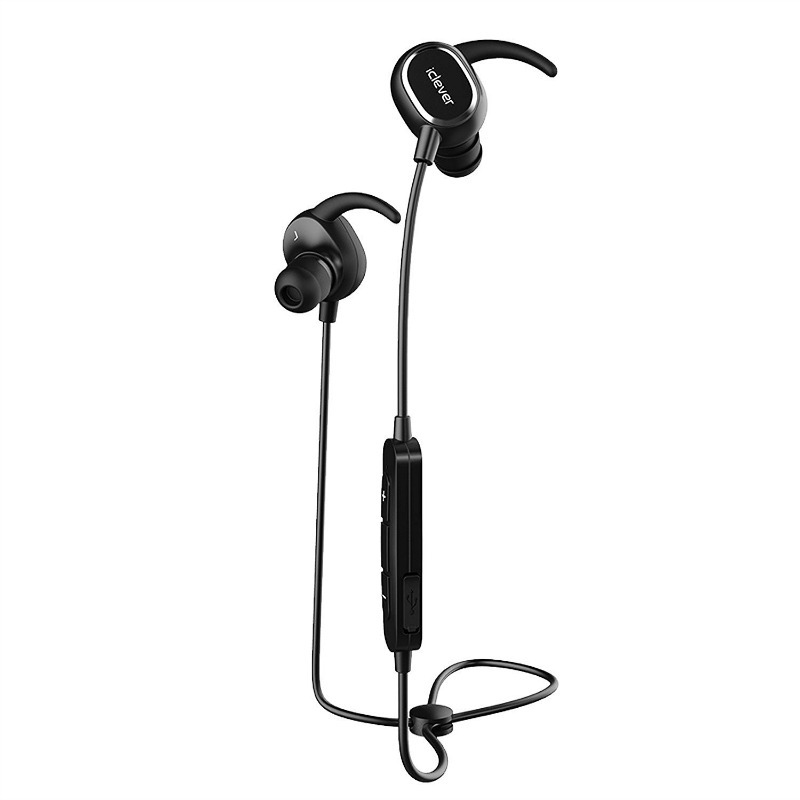 If so, we think you will love the iClever Noise Cancelling Sports Earphones. These sweatproof, wireless headphones have crystal clear sound technology, allowing you to have awesome sounding music and great sound quality on calls. What really makes these Bluetooth headphones great, however, is their side shark fin, curved design for a secure fit, making them great for walking, running, or relaxing on a plane. 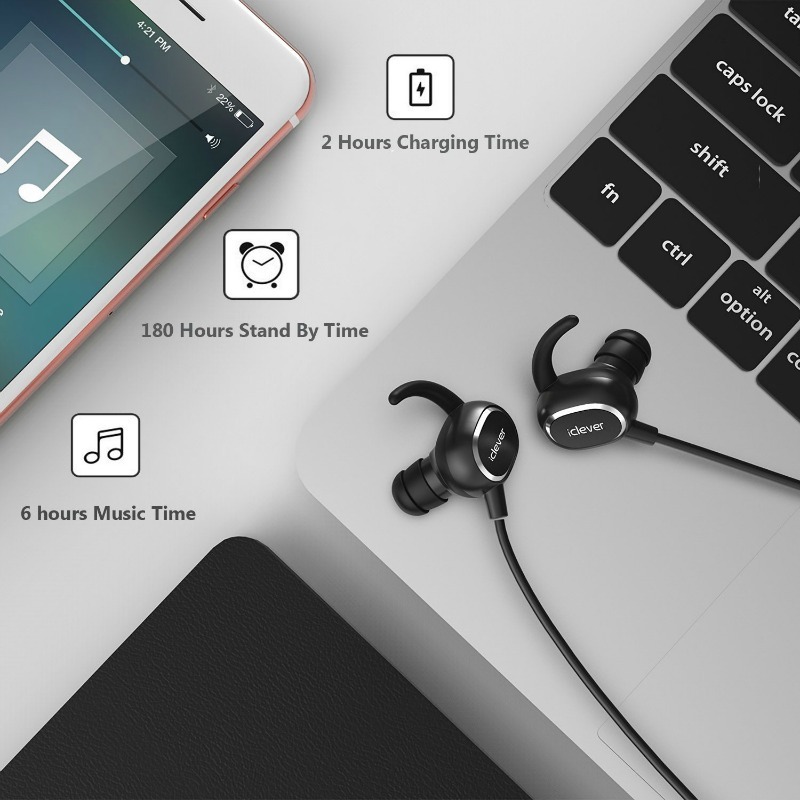 With a six hour battery life, you can enjoy music anywhere without having to worry about charging, making them great for anyone who is on the go, or in need of a set of headphones for a new phone or player without a normal headphone jack. Overall, we had a great experience with this headset. I was amazed that most things actually sounded great, with clear and clean sound quality when it comes to vocals, along with high and midrange sounds. What I will say was disappointing about this headset though is the bass in most songs is there, but not as strongly as the upper ranges; while it may just be due to the headset’s small size, it seems to be the one place where the headset struggles. For a headset though that is under $30, though, it is a great headset if you need something to throw in your purse or exercise bag. Want to purchase these headphones for yourself? You can buy the iClever Noise Cancelling Sports Earphones on Amazon.com for only $27.99. I’d love to have a pair of these. I practice my music that way. These iClever earphones sound like a great product. Thanks for sharing. Oh I bet these would work for my daughter so much better than some of the others she has tried; seems like one side always quits working on her. There seem to be quite a few 1 star reviews with people having problems with them. I’ve had mine for about a month. I think it all has to do with your expectation of them. I knew they weren’t going to sound like my Jabra Sport Pace ($99.99 headphones). For me, I wanted something that would have descent quality but I wouldn’t be upset if they ended up getting smashed in my car or lost during one of our many trips (or lets face it, a malamute deciding they were a nice chew toy). I would put them a bit higher in quality than the ear buds that typically come with brand new Apple products (my Iphone 6S Plus, for example). They also aren’t uncomfortable like most of the super cheap earphone sets you can find in stores. I think many people are comparing them to the ultra high end stuff. End of the day, you do get what you pay for when it sounds to sound product. These headphones are so nice I’d love to have a pair. I am very curious as to how comfortable these are?I like the ones that look like heavy noise protection for the ears! could use these during my work out, I hate it that I can not enjoy my work out because of not being able to listen to music.